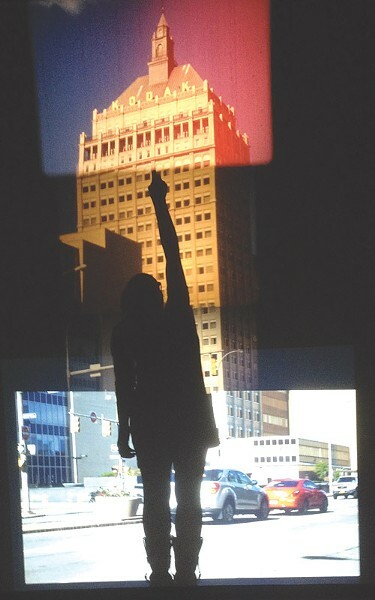 PHOTO PROVIDED Tara Merenda Nelson's "End of Empire" (seen here with a viewer's silhouette) is a projected collage of the Kodak tower using four formats of film. Nelson's show, "Light Sensitive," is currently on view at Visual Studies Workshop. Visual Studies Workshop's current show isn't really representative of Tara Merenda Nelson's film work, most of which is in Super 8 format and tends to follow a "film diary" tradition: "intimate portraits of friends and family, travel diaries, confessions, secrets, that type of thing," she says. Just three strange, cinematic installations comprise the show, each part of a set of research tools the artist developed to investigate the relationship between projected image and the human perceptual mechanism. "End of Empire" dominated the first room of the gallery with a large screen on which four formats of film — discontinued color-reversal film stocks in 16mm, Super 8, and slide film, as well as the digital element of HD video — are projected to compose a single image of the Kodak tower. "This looping installation documents the final days of the Kodak empire, and an elegy to Kodak film in the final days of the industry," Nelson says. The artist moves us symbolically from the past, forward in time from the uppermost image of the tower — a looping film of the top levels of the building, jumping and riddled with nervous lines and imperfections — to the crisp and steady, HD video of the busy street level all the way at the bottom. The collaged image is a portrait of Kodak's once-glorious symbol now met with relative indifference from the bustling world below. Nelson is Visual Studies Workshop's 2014-15 Visiting Artist in Moving Image. During her residency, she has taught workshops in 16mm Film Production and Curating from the Film Collection to the VSW Graduate Students. In addition, Nelson is assisting with the assessment and relocation of the 16mm film collection at VSW, is working on publishing an artist book on the notebooks of French experimental filmmaker Rose Lowder, and teaches Advanced Video Production and Sound Art at the University of Rochester. The artist didn't get into filmmaking until after college, when she began attending regular screenings of locally-produced, experimental films at Squeaky Wheel in Buffalo. Inspired, she took a class at Squeaky Wheel and began making her own films. After moving back to her adopted hometown of Pittsburgh, Nelson joined the experimental film community "Jefferson Presents Experimental Film Collective," and learned to make Super 8 and 16mm films. In 2008, the collective was invited to show a program of films at MoMA. Nelson later earned an MFA from the Massachusetts College of Art and Design, developing her research into the study of cinema and perception. "I am interested in identifying how we perceive images and give them meaning, and how that perception is affected by the light that carries the information and the darkness between the frames, which I consider to be the space of imagination," she says. At first glance, Nelson's "Screens," eight rectangles adhered to the wall at eye-level, appear only to be the same oil slick, slightly shimmering black. But the impenetrable works are meant to be interactive. "Screens" is "an experiment in defining the authority of personal experience, visual memory, and imagination in the realm of cinema-space," Nelson says. For each, emulsion-based photographic paper was used as a projection surface for classic feature films from the VSW film collection. The previously unexposed paper was exposed to light provided by the projector as it played the film. But after processing, "each screen holds no image at all, because of the limitations of the medium: a piece of photographic paper is unable to render an image after an exposure of 60 minutes or more," Nelson says. "But the film is there." Each screen is a blank slate upon which the image plays, sourced only from the particular memory of the viewer. Nelson chose "classic" films because she wanted the audience to conjure up their personal, visual memory of seeing those films. "So when they look at the screen for 'King Kong,' they look for the giant ape, or Fay Wray, or the Empire State Building. And when they look at the Screen for 'Wizard of Oz' they look for the ruby slippers, or the Wicked Witch of the West, or the Yellow Brick Road," she says. "Both the screen and the viewer are witnesses to the same projected light, but it is within the memory and imagination of the viewer that the film lives on." "Catharsis" consists of a 16mm projector pointing out into the gallery with a small fan pointed upright in front of it. Anchored to the center of the fan by a thin thread is a piece of mulberry paper, engaged in a frantic dance like bright flame, or some furiously glowing wraith. Nelson describes the work as "a filmless film with no set duration." There are two ways to view "Catharsis." Stand facing the "screen" — a glowing projected rectangle on the opposite wall — and watch the mesmerizing shadow dance of the twirling paper blocking the light from the projector. The other way to view it is more challenging. A chair is positioned facing the projector, with an invitation for viewers (who are not prone to seizures!) to sit with eyes closed and experience "a film made with their own mind, which only they can see," Nelson says. "In my work, I investigate the psychological space of creativity in search of the internal, eternal imagination," Nelson says. "Where do ideas come from? How does the creative mind manifest itself in our conscious life? My work is motivated by these questions, not for the sake of answers, but for benefit of the pursuit." Confronting the work is uncomfortable: a riotous assault of flickering light gives the feeling of a vibrantly-hued presence pressing in too close, permeating the eyelids, the thick intensity giving way to shifting shapes and patterns. An almost hallucinatory state hints at the edges of REM-like eyeball flinching, and through my closed lids I could detect the frustrated upward motion of that tethered paper. The piece is pretty aptly titled, if we think of the word as a pointing to a necessary displeasure, with the calm following the chaotic storm a beautiful relief by comparison. Catharsis has been defined as "the purging of the emotions or relieving of emotional tensions, especially through certain kinds of art." Nelson says she chose the term to represent a breakthrough for in her process of pursuing the location of the imagination. There is also often a performance aspect to Nelson's work, using multiple projectors, live sound, a unique live editing technique, and other interactive elements. Nelson and her husband, Gordon Nelson, perform together as a group called Shades of Fawn. A program of their films called "Movies from the Multiverse" was performed on November 7 at the opening of "Light Sensitive" in the Visual Studies Workshop auditorium. Shades of Fawn will host another show in early 2015. View more of Nelson's work at vimeo.com/taranelson/videos.